In connection with the recent (January 2007) release of the restored Les Anges du Péché on Region-0, PAL DVD (with English, Spanish, German, and Italian subtitles) by Gallimard in France, here is our own review of the film. Long unavailable on revival or official video circuits, Robert Bresson's first feature--made during the occupation in 1943 shortly after his one-year German imprisonment--was digitally restored by the Centre Nationale de la Cinématographie in 2005, screened at the Cannes Film Festival, and recently released on DVD by Éditions Gallimard. 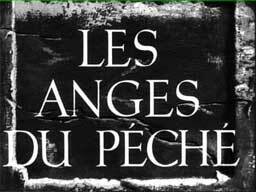 Though Les Anges du Péché has often been categorized as an unrefined, early work ("Bresson before Bresson," Jean Sémolué labeled it), the film was highly regarded in its day; at 25-years old, fledgling critic André Bazin championed it as one of the year's best, a "great film" of "international stature." Later in 1951, he elaborated: "In it, for the first time in the cinema, the problems of the spiritual life are described, if not in indisputable terms, then in any case in their intellectual, moral, and social ramifications." As late as 1975, Truffaut wrote that the movie "has probably remained the best film of this period." Les Anges established 42-year-old Bresson's career, today offers an evocative sense of its era, and suggests beautiful glimpses of the filmmaker's signature style. It has been remade at least once: Hagen Muller-Stahl's television drama, Bethanien (1966). Perhaps surprisingly, French cinema thrived under the Occupation (220 films produced in four years); movies were a popular escape for Parisians, and distributors scrambled to fill the void generated by the German ban on many imported films, particular those from America. New positions within the industry became available due to fleeing or deported personnel. As Evelyn Ehrlich writes in her book on the period, Cinema of Paradox (1985), "it is likely that the unknown Bresson had less difficulty finding financing for his first film than he would later have as one of the established masters of the French cinema." Partly, this was due to the efforts of pioneering producer Roland Tual, who rescued the project from an unenthusiastic Pathé. The script was written by Bresson and Legion of Honor-winning dramatist Jean Giraudoux (whose 1944 novelization was entitled Bethanie). It was based on an idea by Raymond-Leopold Bruckberger, a Dominican priest who wanted to highlight the work of the Sisters of Bethany, an unusual ministry that cared for women prisoners and also welcomed former convicts into their Order, provocatively (for some) blurring the lines between sinner and saint. The film's plot follows Anne-Marie (Renée Faure), an idealistic bourgeois initiate who sets her sites on redeeming "the most miserable"; she settles on Thérèse (Jany Holt), an angry prisoner who initially rejects her friendly motions, but later joins the convent simply to evade the law. Thus, the dialectic between humility and pride within Anne-Marie dovetails into questions of worldly engagement versus religious isolation, and Thérèse's guilt versus redemption. Bresson would later disparage the film's melodramatic elements as well as its occasional theatrical acting, but what might have seemed like indulgence by his later standards has widely been recognized as restraint by others. Though the dialogue often sounds poetic ("She stains anything white!") and the film's penchant for closing scenes with Sisterly words of wisdom grows a bit tedious, Bazin immediately praised the film's "exactitude," writing that it "establishes, after the novelist and the playwright, a third Giraudoux capable of renouncing all preciousness and of stripping his style to meet the elliptical demands of cinema." Though he ironically claims he doesn't have enough space to praise Bresson, one can easily recognize in his description a lucidity and essentialism that would typify the filmmaker's later career. With the benefit of hindsight, Raymond Durgnat writes of the "Bressonisation" of the dialogue: "The playwright's gift for philosophical, rather than for psychological drama already suited Bresson's vision of providence overriding psychology, but his abundance of phrases had to be reduced to bedrock terseness, his gracefulness made ascetic. Already Bresson detheatricalises drama without loss of intensity." The film not only sets the tone for subsequent Bressonian pruning, but also for his quietly urgent, episodic sense of rhythm: numerous short scenes are bookended by fade-ins and fade-outs; Thérèse's violent revenge and the police followup could not be rendered more briskly. (And Bresson's singular focus on Thérèse during her preparations and crime, leaving everyone else offscreen, is deliciously intense.) Cinematographer Philippe Agostini's (Le Jour se lève) slanting, chiaroscuro lighting would similarly define Bresson's second feature, Les Dames du Bois de Boulogne, and composer Jean-Jacques Grünenwald's bombastic themes and brooding accompaniment would adorn that film as well as Diary of a Country Priest; but the filmmaker would eventually rein-in both elements, preferring a restricted visual palette and ambient sound mixes. 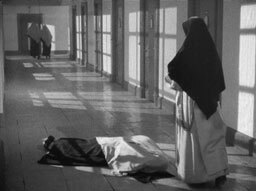 He would also come to cherish the 50mm lens, but Agostini's use of deep focus--especially in the film's early scenes emphasizing figures traversing long hallways in the convent and the prison--are striking in their visual clarity. While it may not assert itself overtly, Bresson's early interest in the effects of sound are also in evidence, from the squeaky wheels on Thérèse's food cart, which grate on the ears and emphasize the grueling aspects of her captivity, to the clever removal of her shoes as she attempts to escape, to--most obviously--her penetrating, offscreen shrieks. While the sound design may not reach the heights of A Man Escaped, it nevertheless reveals a filmmaker already acutely aware of its effects. Moreover, the film projects a distinct Bressonian sensibility in its fascination with the darker side of religious life, not only the suffering and struggling that occurs between spirit and flesh, but also the psychological turmoil that can flourish within religious codes and institutions. Four years before Powell and Pressburger's Black Narcissus, Bresson depicts the shifting allegiances, manipulations, self-serving attitudes, envies, and petty jealousies that boil within the convent, stressing the ambiguity between those who offer grace and those who seek it, as well as the tension between the monastic life and the encroaching world. In a subplot worthy of Val Lewton, the sub-Prioress' black cat--teasingly glimpsed throughout the picture--becomes the manifestation of the growing bitterness between Sisters. Anne-Marie herself highlight's the perversity of the situation when she confesses, "I assigned myself a high mission, but could only bully a cat." Although some commentators have suggested the film's sense of isolationism is idealized (rendering it apolitical and therefore commendable to the censors), the interpersonal tensions of its characters seem directly the result of the community's extreme seclusion; its ingrown, predatory emotions are the flip-side of a healthy, self-sufficient communion that could just as easily be read as a commentary on the deflating effects of an occupied culture. If anything, the film's denouement, which brings together the collision of interior and exterior worlds, emphasizes the inescapability of the physical world and its social structures. Anne-Marie's sickness and death are a result of her inner obsessions, and Thérèse's debt to society isn't a separate issue from her spiritual salvation; like Michel in Pickpocket, facing external consequences is a necessary step to finding inner peace. With the sensuous shots of rain falling on Anne-Marie's face or the handcuffs clasping around Thérèse's naked wrist, Bresson is beginning his profound investigation of the linkage between bodies and souls. In Cahiers du Cinema in 1953, Eric Rohmer wrote, "No one dies of love in the movies, or of an excess of scruples, as in [Balzac's] Honorine or [Goethe's] Elective Affinities . . . because the art of the screen is not yet able to make tangible the evidence of the soul's influence on the body. I bet that it will come. Don't we already see the start of this in certain scenes of Under Capricorn or Les Anges du Péché?" For all its undeniable theatricality, the film remains unmistakably a work of Bresson; were it not actually directed by the filmmaker himself, it would undoubtedly have earned the descriptive moniker "Bressonian" on many occasions.